I'm up to week 22 of the TAST challenge (a few weeks behind but who cares!) and it's on to Satin stitch. My first attempt was done on aida fabric and because of the fabric squares the stitches are spaced out and the effect is more like darning stitch than satin stitch. 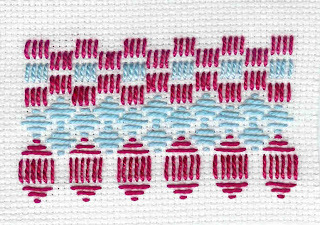 I like this but thought I'd also have a go at a more conventional version using a linen fabric. 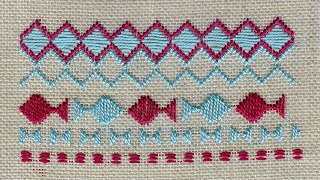 My fish row was going to be a row of waves but when I started to get the fish shape I couldn't resist!